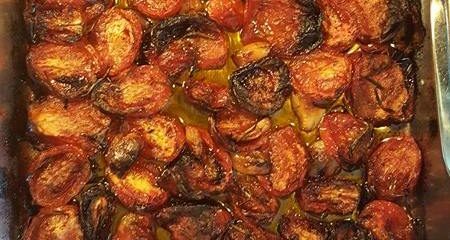 Savory EVOO Roasted Tomatoes! More than a Recipe…it’s an Event!! CHRISTMAS CAME EARLY TO THE OKANAGAN?! …ok so maybe not Santa Clause, but these beauty roasted tomatoes, fresh from Davison Orchards, in Vernon, and en-robed in Olive Us EVOO (extra virgin olive oil), are a treat to last the winter! So much fun to pick the tomatoes with family or friends! Jan loves picking tomatoes with her mom, Pat, an ever enthusiastic pal in any adventure!! Rich with flavour and healthy as could be, here’s the recipe for year-round goodness. Preheat oven to 400°F (375°F for convection bake; when baking multiple pans). Regular oven is fine for smaller batches! Rinse tomatoes. 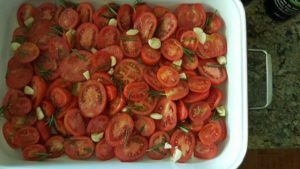 Slice each tomato in half lengthwise, placing it cut side up in one of the roasting pans. Place larger tomatoes towards the edge when possible. Overlap of larger tomatoes with small is fine; they will look crowded. Once the pans are full, de-stem rosemary so that you have little sprigs and tuck them under the tomatoes to avoid burning. With the side of a large knife, partially crush garlic cloves and place in gaps (avoiding the outside of pan as they are more prone to burning there). Drizzle each pan with Olive Us Rosemary Fused olive oil and then with the remaining EVOO (garlic or a single varietal). Sprinkle with Himalayan pink sea salt and evenly grind pepper over the pans. Place pans in oven, do not cover with foil. After one hour, reduce temperature to 350°F and drizzle with a bit more EVOO. Continue cooking for another 2 hours. Tomatoes may be slightly burnt and very reduced in size, with liquid and olive oil in the bottom of the pan. If tomatoes start to get too dark, reduce temperature slightly and continue cooking. Once cooled, transfer tomatoes (along with any liquids) into freezer bags/containers and freeze. Whenever you need tomato sauce just take some out and heat in a pan for an instant duo with pasta (can leave whole or blend with some cream and stock to make a sauce, or add spicy Italian sausage, cooked chicken, etc)! Fantastic in soups, stews or anything where you want that fabulous flavour! Makes such a delicious snack right out of the oven that you just may end up with two pans instead of three! *We tend to use Roma tomatoes because they are more meaty than other tomatoes, but this also works good with regular tomatoes. If tomatoes are large, cut into quarters instead of halves, as they’ll release more moisture and cook quicker.